Do you sometimes feel stuck, despite real efforts to gain momentum on goals you’ve set? 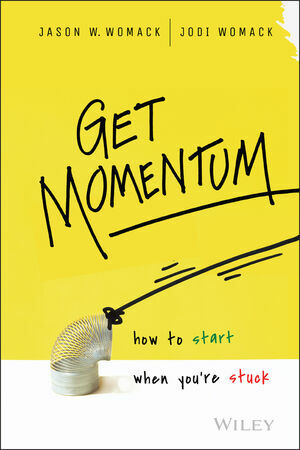 Momentum means you’re doing more than simply getting things done. It’s that feeling of satisfaction, the belief that you can achieve big goals and complete important projects that fulfill you both personally and professionally. Get Momentum coaches you in the mindset, skill set, and toolkit required to make progress on the items you have on your life and work goals faster and easier, while living a less stressful, more meaningful life. The authors, Jodi Womack and her husband Jason Womack, provide valuable insights into the psychology of change and how to direct your focus to experience fulfillment at work and in life. The authors share what they know having built a successful executive coaching firm together, as well as facilitating leadership workshops in their home town and more than twenty countries around the world. Contrary to the promise of many self-help/business books, they believe there is no one-size-fits-all recipe for success.Get Momentum teaches you how to make proactive changes based on the solid foundation of your own “quality of life” criteria. Jodi and Jason offer clear, step-by-step guidance on how to define your personal criteria so that you can Get Momentum, improve your life and enhance your career. With kindness, accountability and encouragement, Get Momentum will help you tap into your natural way of being to achieve professional goals and personal experiences that are on your bucket list, living a life you’re proud to share with others.